This is a compact trip combining the best African experiences. The exhilaration of whitewater rafting on the Zambezi; the serenity of camping on beautiful sandy beaches with the peaceful hum of the surrounding wildlife; the finale of a mind-blowing helicopter flight through Batoka Gorge and over the gorgeous Victoria Falls. This is then finished off with a spectacular close encounter with wild game on a 3 day Safari in Botswana. The perfect holiday for those with less time, but still wanting the ultimate adventure. Arrive in Livingstone and be met by one of our guides, then transfer to hotel. Free time to explore or relax. An evening pre-trip briefing and an optional balloon flight over the falls is available  sipping champagne as you watch the sunset. Or if this is not to your liking, there is an optional booze cruise on the upper river amidst a myriad of wildlife. After breakfast and safety briefing we start the trip beneath Victoria Falls and prepare for one of the most action packed and adrenalin fuelled rafting adventures in the world. The day is rounded off with a well deserved cold beer at camp watching another amazing African sunset and preparing for our 1st night under the stars. 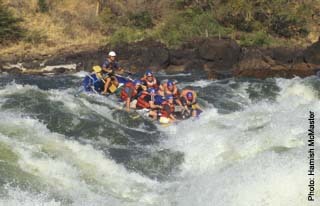 After breakfast the rafts are loaded and the fun continues, running the biggest rapid of the trip, Oblivion. With G & Ts in hand and smiles all round, our evening meal is prepared and we settle in for a night with many tales to be told. Morning Shower is the 1st rapid of the day, waking us from our warm sunny daze. The river begins to open out more, Fish Eagles fly overhead and more huge rapids follow. Sundowners are enjoyed as we take in the beauty of the Lower Moemba at dusk. We drift downstream, crashing through more powerful rapids. At Chabango Falls we stop for a lovely lunch in the shade before powering our way through the longest rapid on the river Ghostrider  the perfect rapid to end our rafting adventure on. The helicopters then await us for an amazing flight back up the river and over the rapids we have paddled in the last 4 days. Staying in a luxury hotel high above the river we spend the evening with sundowners on the balcony admiring the exquisite views. You have just completed one of the 10 Classic River Trips in the world and you will feel exhilarated, we promise you. Breakfast at your hotel and transfer Botswana for your safari. A day spent game viewing together with a lunch cruise and a relaxing evening. Game drive pre-breakfast and a great day experiencing the stunning creatures of Africa. After a game drive and wholesome breakfast we return to Livingstone Airport for our flight home. Price includes: Airport transfers, all accommodation, all meals, guides, all transport during trip. Excludes: personal insurance, pre/post trip meals, personal drinks (soft drinks, beer etc. ), international flight.